I can't seem to make myself take one of these. I don't know why. It seems reasonably easy for the other members of the office to sign up for a day or two or five off. But I just don't take them. Then, in March of next year, I'll be scrambling to use up 2 weeks of accumulated days off. I get 3 weeks now. I've been at this job for 12 years, so the weeks are there. I don't take them. I lost 3 days carried over from last year because we were too busy to allow me to take those. I've taken one day so far. Vacations, time off, is a right we have worked hard to achieve. This exchange from the 1951 movie A Christmas Carol sums up the Victorian view of work. Ebenezer: Yes, and put their hands into my pockets as it were, sir. No work. No pay. We've come a long way from that mind-set, at least most of us have. I remember when my dad decided that vacations were something we should experience. When you work a farm, there is always, always, something that needs to be done, every day. You get a few scattered hours during the course of a day to just sit. When it rained, dad could be found sitting in the shed just watching it rain. Winter was a down time. There were animals to care for but, once they were done, the rest of the day was at leisure. A summer vacation was a luxury few farmers could afford. If we went anywhere, it was for 4 days to Cedar Rapids where my mother's family was or to Des Moines where dad's sister lived. Beyond that, going anywhere outside of that sphere wasn't in the cards. Someone had to watch the animals and the farm while you were gone. I don't remember when dad decided we deserved time away from the farm as much as anyone else did. 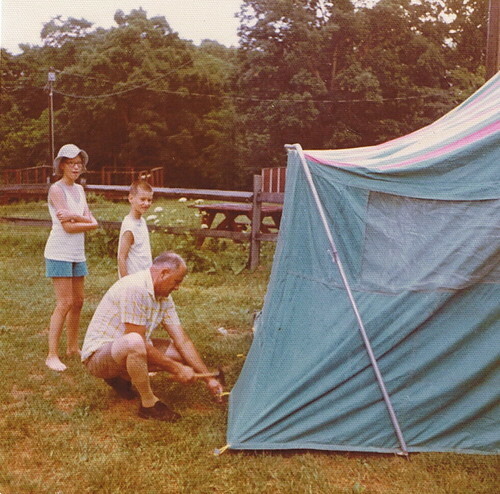 He liked to camp and bought a tent. We went all over the Midwest with that tent and we did a two week swing through the south, a big circle from Iowa to Louisville to Memphis to Pigeon Forge, Tennessee and the Smoky Mountains to Huntsville, Alabama to Mobile to driving over Lake Pontchartrain north of New Orleans to St. Louis to Muscatine, Iowa where dad's brother lived to home. We made some wrong turns but we saw a huge swath of the country, camping all the way. Dad's brother, LeRoy, and a few cousins, took turns looking in on the farm, mowing the lawn, feeding the animals, weeding the garden. It was an amazing adventure. I've been a few places requiring vacation time. Last year was the wedding. I've been to Seattle when Carole lived there. 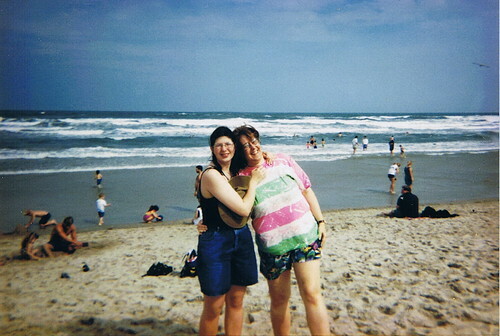 When she was younger, we drove to Charlotte, North Carolina. We went to San Antonio, Texas on the train. We've been to Disney World and the Atlantic Ocean. I live in an area where there is no lack of things to do. I've chosen to stay here precisely for that reason, not that I take advantage of those things. It's nice to know they are there if I choose to. Yet, why don't I? Some of it is the lack of finances. Doing things costs money, from admission fees, to gas, to parking, to food, to souvenirs. Now, there are ways to mitigate those costs but there are costs to vacations. And I just don't have funds to sink into a vacation or a lot of admission fees or parking costs. I also come from a work ethic that taps into the above Scrooge mentality. No work. No pay. It's so very hard to leave that behind. I wonder why. So, as the summer ticks through with it's long days and the opportunity to be out and about, I sit at my desk and look at the vacation request form. I could take time off here or there. We're not that busy that my being gone would be a huge inconvenience. I want to save a few days for a visit east in October but that will still mean I have weeks of vacation left to use up before I lose it. Why can't I take it? Why can't I fill out the line requesting days off? Have I bought so totally into the idea that unless I "go" somewhere, I'm not really vacationing? Sleeping late for a whole week or staying up late for a whole week would be good for the soul. Why can't I? For the record, I still have that tee shirt and those shorts. They have worn like cast iron and are still every bit as bright and loud as they are in that photo.